As I recently ran out of my Anastasia Beverly Hills Brow Definer in Soft Brown which I got on our vacation in California and I heard lots of great things about the “Benefit Ka-Brow!“ I made a little journey to boots on Black Friday with a mission of getting some nice, new products for my brows. 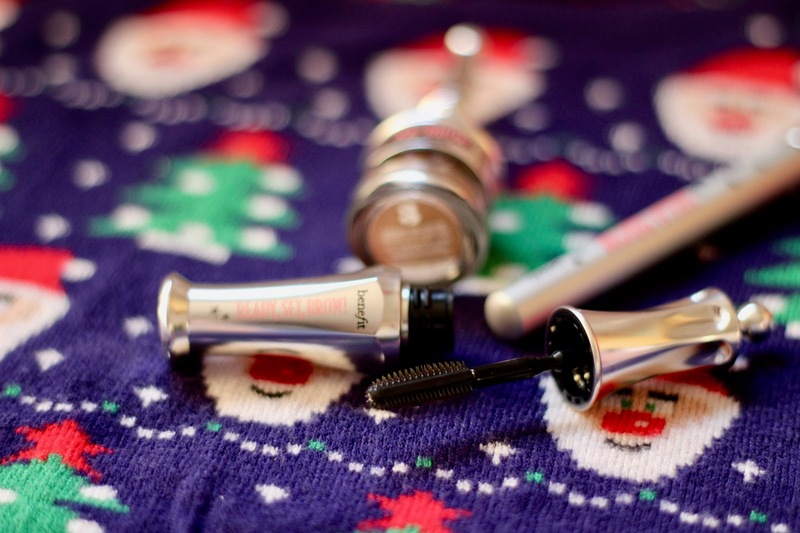 With their gorgeous packaging and their lovely high-quality products, Benefit is one of my favourite brands and I was really excited to try out some new stuff from them. As I was looking at the Ka-Brow! 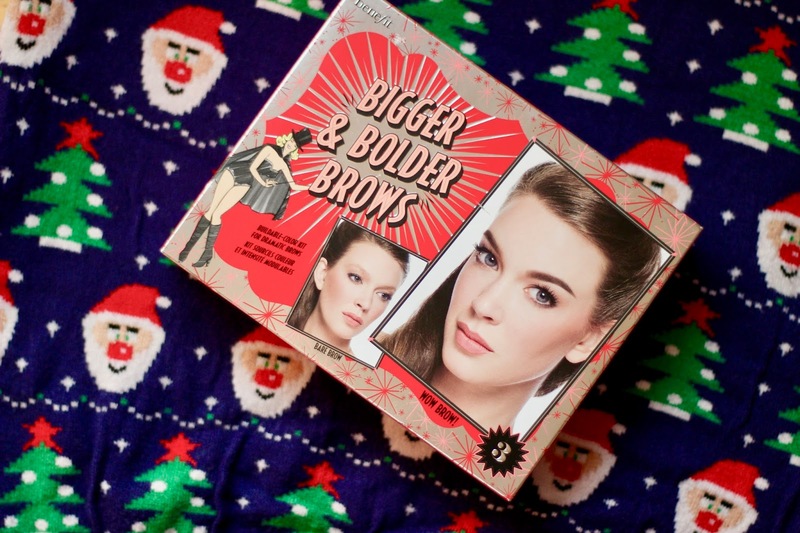 which retails for a price of £18, the lovely lady on the Benefit counter introduced me to the “Bigger & Bolder Brows Gift set“, which contained “Ka-Brow!“ as well as 2 other products from the Benefit Brow range for only £10 more. 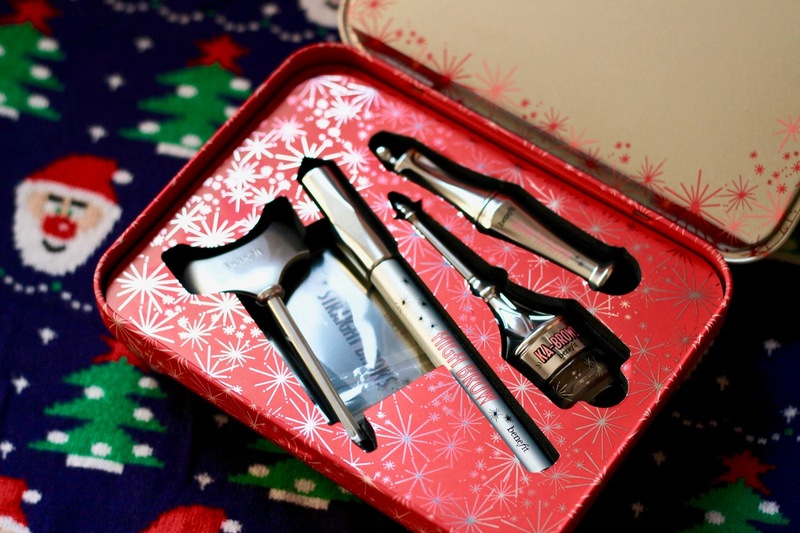 As I needed a new brow gel anyway, and this would be included in the gift set, I decided to treat myself to this lovely piece for £28. When trying out the set I wasn’t surprised that the quality of the products was rather fabulous. Not only the quality of the products themselves, but also their innovative, thoughtful and gorgeous packaging really convinced me to promote this set as a cute gift idea for Christmas here on my blog! 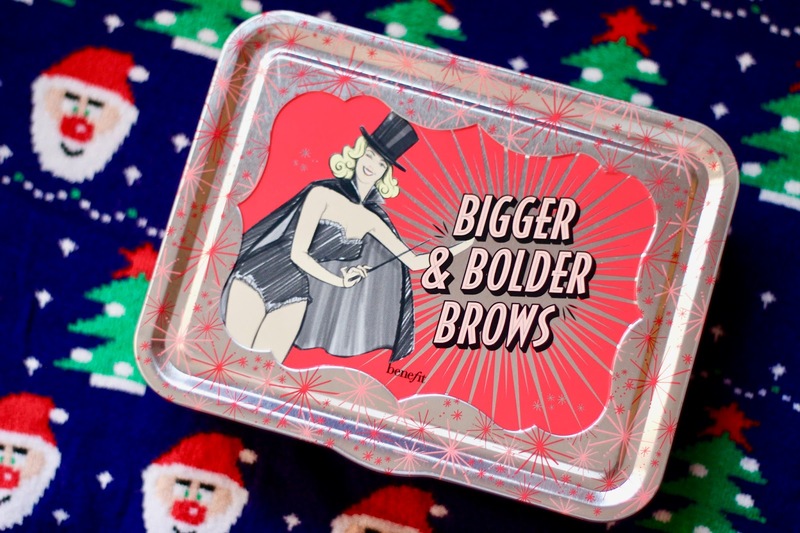 The 3 products come in this rather cute and festive gift box, which embodies the brow range’s theme of circus quite well. When you open it up you get a nice little description and handbook to all the products, which will help you or the person you are gifting this set to help to understand the purpose of each product easily. Then there is this tin box filled with the goodies, which itself is just so beautiful and I really don’t want to get rid of this as it would be a cute decor on your makeup table or a storage box for your room. 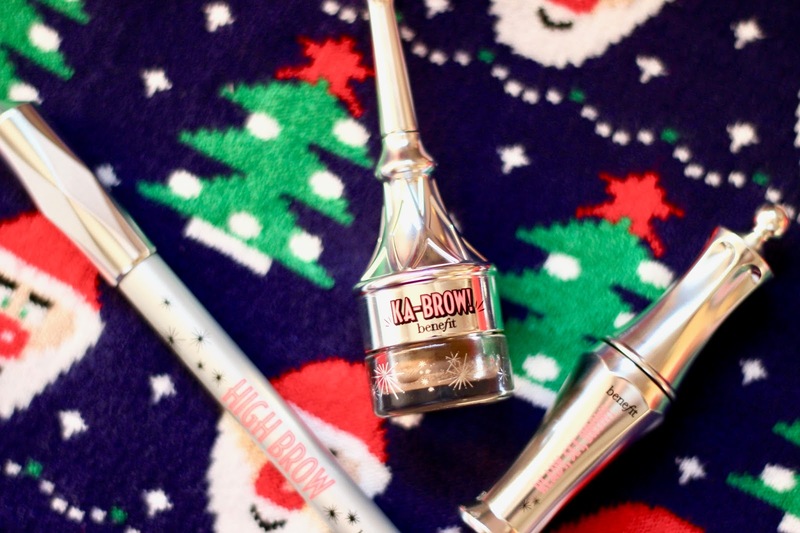 In the “Bigger & Bolder Brows Gift Set“ you get the full size of Benefit “Ka-Brow!“ and Benefit “High Brow Pencil“ as well as a travel size of the “Ready, Set, Brow!“ setting gel. 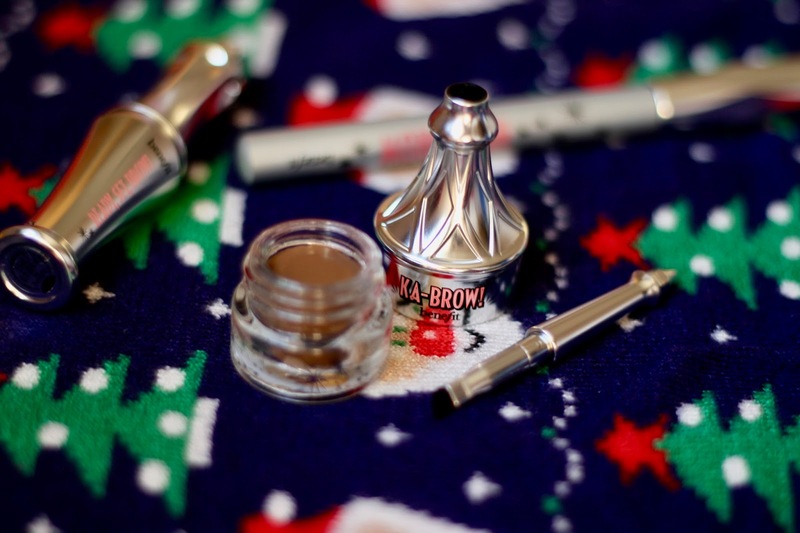 The Benefit “Ka-Brow!“ is a cream-gel brow colour that in its concept is very similar to products like the Anastasia Dip Brow. So it’s basically a gel eyeliner that you can apply with the little angled brush that comes with the product (I personally prefer using the Zoeva 317 Wing Liner Brush as it is a little bigger) and it achieves the most defined yet natural looking brows. It is very long-lasting and it is in my opinion easier and quicker to work with than f.e. brow pencils as it looks a lot more natural and you have a lot of control over what you are doing. 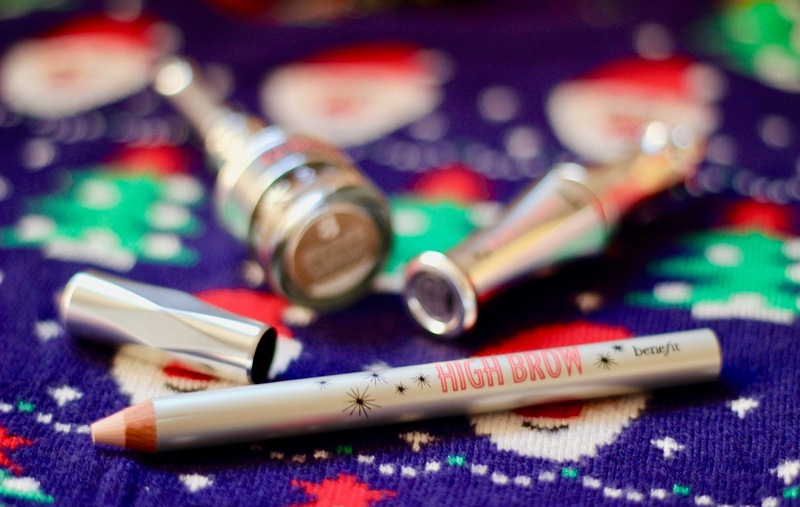 The Benefit “High Brow Pencil“ is a creamy brow highlighting pencil that you apply underneath your brows to create an appearance of lifted eyebrows and with that a wider and bigger looking eye area (if that makes any sense). It is also great to use when your eyebrows need a little shaping but you are just too lazy to plug them as the pencil slightly covers the random hairs. 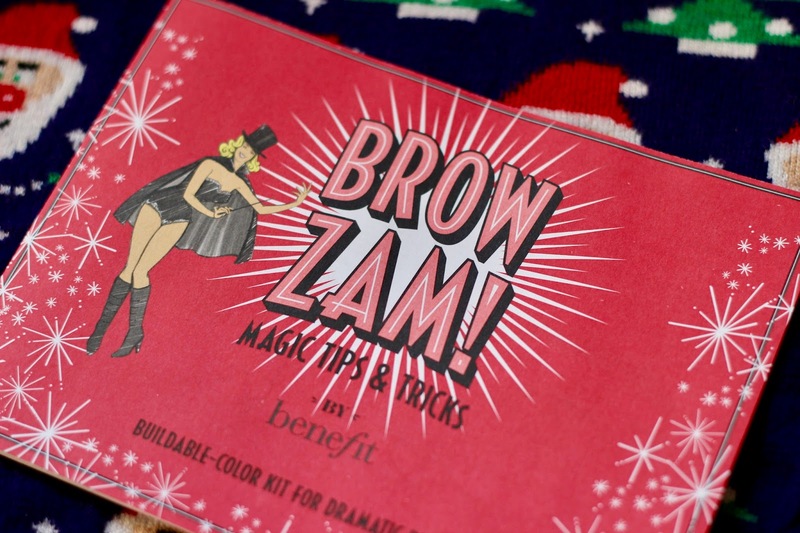 This product alone would retail for a price of £17.50, so even just this product and “Ka-Brow!" would separately cost over £35, when you get this lovely gift set for only £28 - simply a great value for money. The “Ready, Set, Brow!“ is an 24-hour invisible shaping & setting gel for brows you use to keep your brows in place all day long. As it comes in a little travel size it is perfect to try out and decide if you want to invest in the full size product later on. Ultimately, this gift set is an incredible value for money and a lovely idea for a gift for every beauty lover in your life. Just stick a bow on it and put it under the Christmas tree as any wrapping with this fabulous packaging is really not needed. The products are wonderful quality and will last you a very long time. 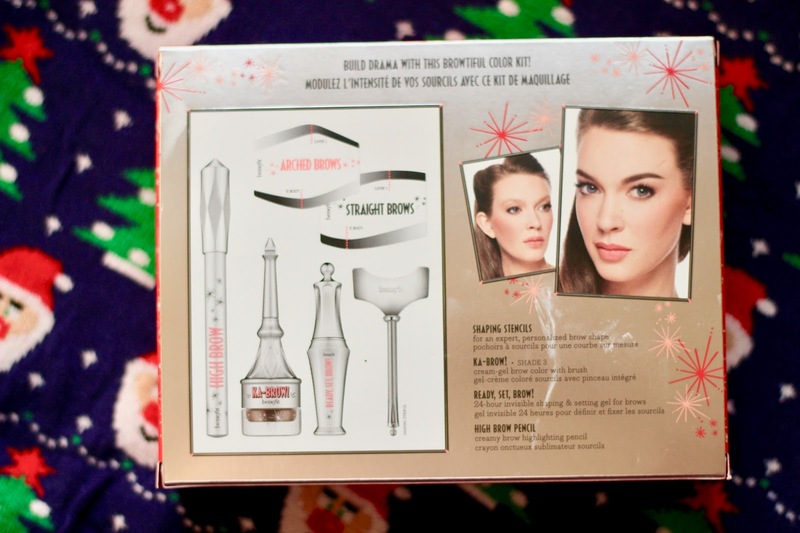 So whether it is for yourself or for a lucky person in your life, I can warmly and genuinely recommend the “Benefit Bigger & Bolder Brows Gift Set“. Happy first advent guys! It’s beginning to look a lot like Christmas and I’m beyond excited as this is the most wonderful and magical time of the year and when it comes to me, I’m probably one of the most Christmas obsessed people you will come across. Like I would have done back home in Germany, I put up my Christmas decorations last Monday, trying to make my sparsely furnished dorm room as christmassy and festive looking as possible, I got out my traditional ore-mountain Christmas CDs and I ate a delicious piece of Stollen (a German Christmas cake) my mum sent me from the local bakery in my hometown. 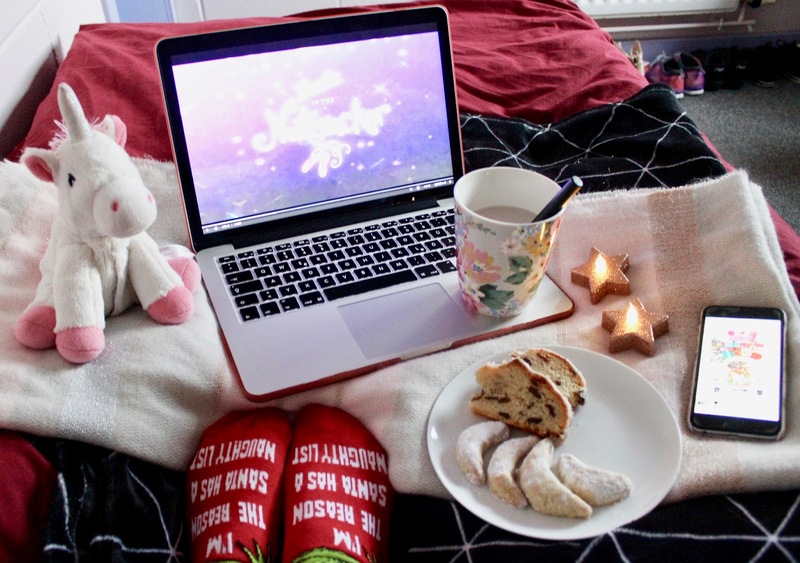 Consequently every part of my day becomes christmasfied, from listening to Christmas music when getting ready in the morning, to wearing my Christmas sweaters in Uni, to buying Christmas presents to my cozy winter nightly routine. As I do most of my hard Uni work in the morning I don’t have to do a lot after my wee afternoon tea, I lately enjoy taking some time to do watercolour painting. 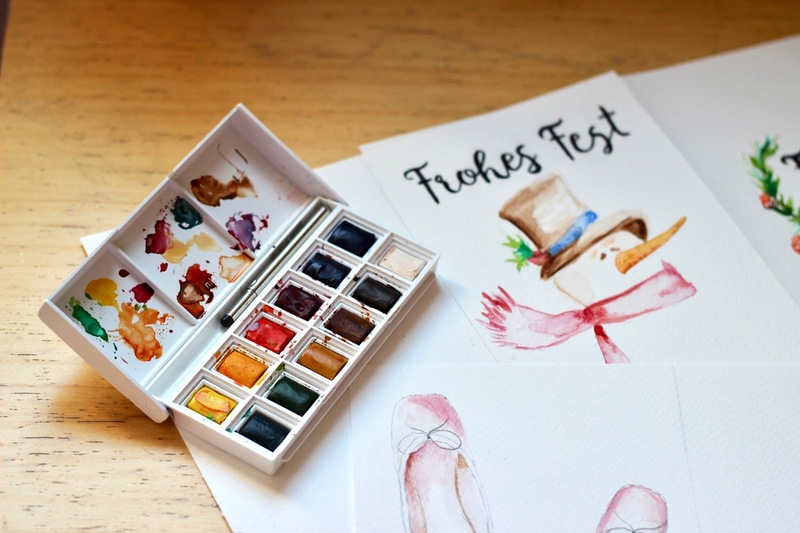 I use the outcomes for coursework at Uni and for Christmas cards for my grandmas - therefore they are saying “Frohes Fest“ which is German for “Merry Christmas“. I splurged on some good “Winsor & Newton Cotman water colours“ from amazon and “Daler Rowney Aquafine watercolour paper“ and brushes from WHSmith. 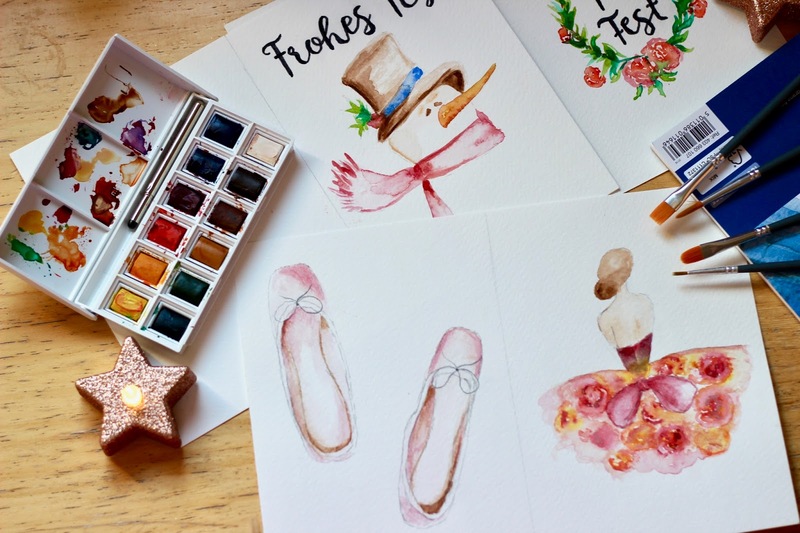 Watercolouring is so fun and relaxing and looks simply beautiful with lovely, easy achievable designs and effects. While doing that I either listen to traditional ore-mountain (which is area in Germany where I’m from) Christmas music or Tchaikovsky' rather magical Nutcracker suite. Honestly I have never been into skincare a lot, but since my skin is acting up lately and needs some love and care I have been adding some new fabulous products to my skincare routine. For a super deep skin cleanse I enjoy using the “No Clogs Allowed Deep Pore Detox Mask“ by Soap & Glory, which I have used up a whole tube back home in Germany and decided to repurchase it here as it is a multi-action, powerful, pore-purifying, at-home facial detox mask which uses heat to emulsify stubborn pore-plugging grease and softens keratinised skin cells to prevent breakouts and blemishes. A new mask I recently purchased is the “Tea Tree Skin Clearing Clay Mask“ from The Body Shop which contains tamanu oil, lemon tea tree oil and menthol and is said to fight the look of imperfections by minimising breakouts with regular use. As I know that tea tree oil works well on my skin, I decided to try this mask and my first impression is quite good. Following that I moisturise my face using the “Simple Clear Skin Oil Balancing Moisturiser“ which is naturally antibacterial for healthy clear skin and shine control. For my body I like using the “French Lavender & Honey 24 hour moisture Ultra Shea Body Cream“ from Bath&Body Works and for my hands the “Frosted Berries Hand Cream“ from The Body Shop - both smell heavenly and are nice and nourishing. As I have this really annoying dry patch under one eye I try to fight that with my Soap&Glory “Puffy Eye Attack Turbo-Boost Hydragel“ and my The Body Shop “Vitamin E Eye Cream“. I love the refreshing and calming feeling they leave and I really hope to successfully eradicate the dry patch with those products. 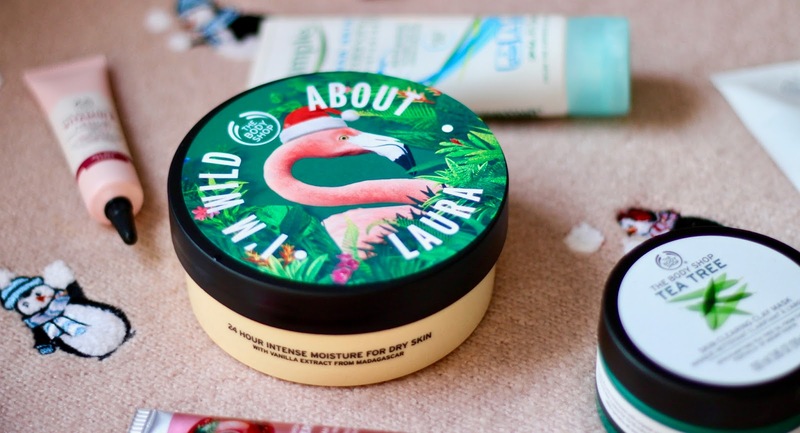 The last thing I want to share with you is this rather lovely personalised “Vanilla Chai Softening Body Butter“ from The Body Shop, which I got gifted at a Blogger event last week. 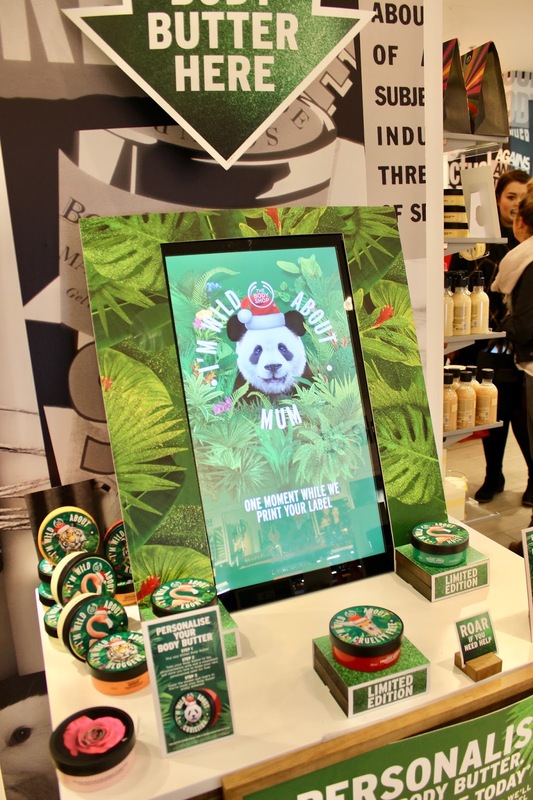 I adore The Body Shop as a brand with their wonderful and valuable commitment to protect our planet by i.a. fighting against animal testing and reducing the environmental footprint and their aim of being the most ethical and truly sustainable global business. This Christmas they our doing an especially wonderful campaign, by restoring 1 Square metre of rainforest with every selected Christmas gift you buy. So by buying Christmas presents there, you are not only are you giving a lovely, high-quality product to your loved ones but you are more importantly helping to protect endangered creatures. What really spoke to me was the fabulous idea of personalising the famous, deeply nourishing and heavenly smelling body butters with the name of your choice for free. So when you pick out your favourite body butters - mine are the strawberry one as well as the British rose one - you go to one of the machines with a lovely employee printing out a personalised sticker for you and putting it on your body butter. 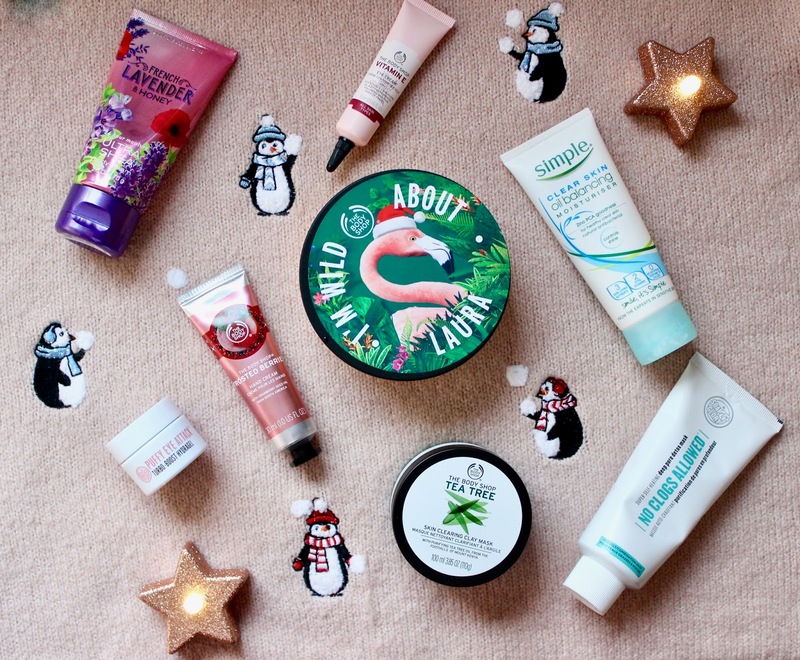 The Body Shop offers incredibly gorgeous Christmas gift sets on a wide price range - so it’s honestly the perfect choice for a Christmas gift everyone will love and value, while contributing to the admirable message The Body Shop strives to spread. "Life is short and the world is wide." 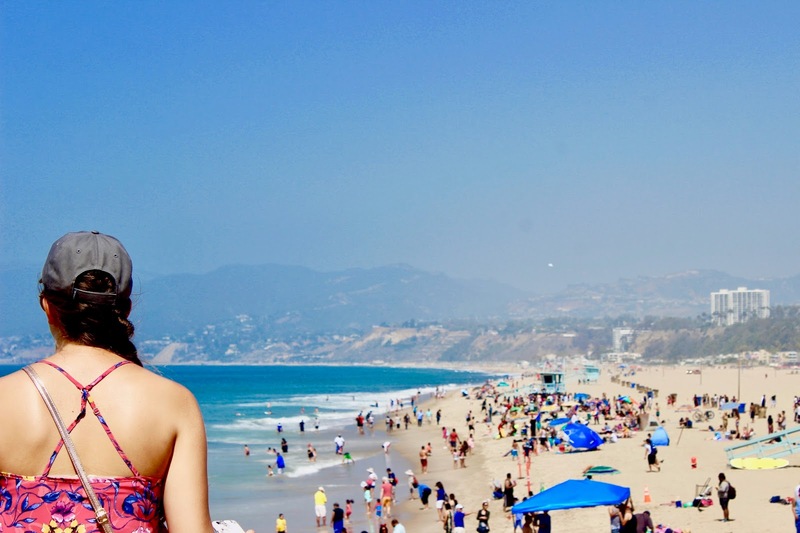 This summer my parents and I travelled through the beautiful sunny state California visiting San Francisco, Yosemite National park, Las Vegas, Los Angeles, Santa Barbara, Monterey and Santa Cruz. We had the most amazing, memorable time and took so many incredibly pictures, that it would be a shame not to share them on this blog. Coming to LA I didn’t have any big expectations due to some of my friends telling me that this city isn’t as glamorous and wonderful as we all imagine. To be honest, I have to agree with them in so far that indeed some of LA’s corners aren’t really nice - for example the Hollywood walk of fame, which we found really overflowing, dirty and nothing we would come back to. To be fair everyone wants to see the famous stars once in their life, but it is really not something I would do again. 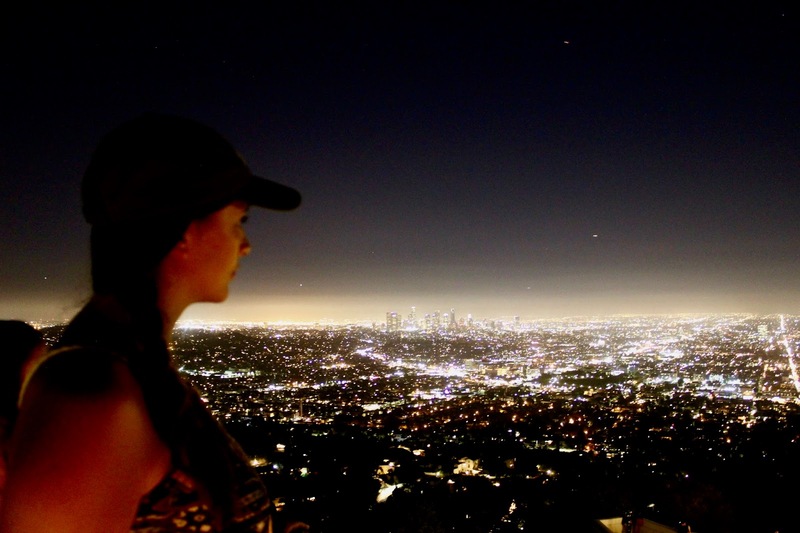 What I say is that LA is lovely, when you know were to go. Therefore I am bringing you 5 things to do LA. We stayed at a rather fabulous airbnb located in Koreatown, a really lovely neighbourhood near to West Hollywood. 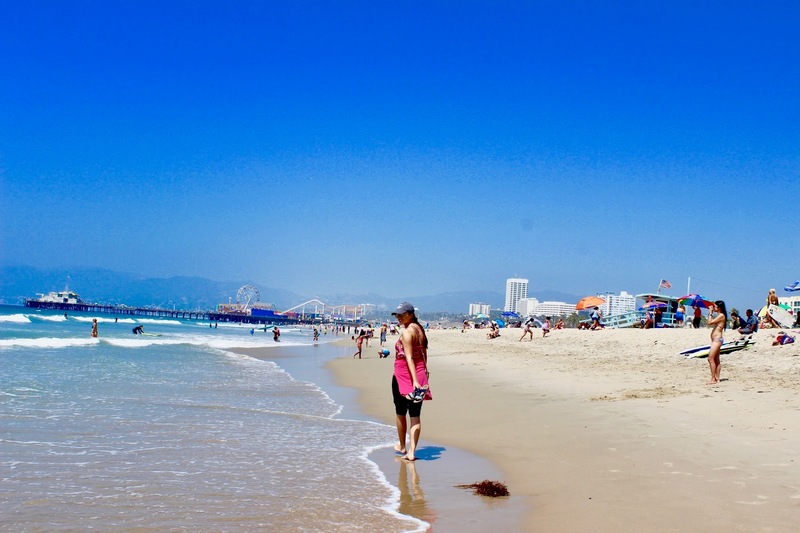 I would absolutely recommend staying in the centre of Los Angeles, really close to all the attractions, as traffic in LA is horrendous and you don’t want to be stuck in there for hours. 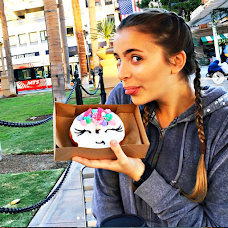 Our place was only 10 minutes away from beautiful places like “The Grove“ and the farmers market and 20 minutes away from my all time favourite place, the Universal studios, which will be my first recommendation on “Things to do in Los Angeles“. 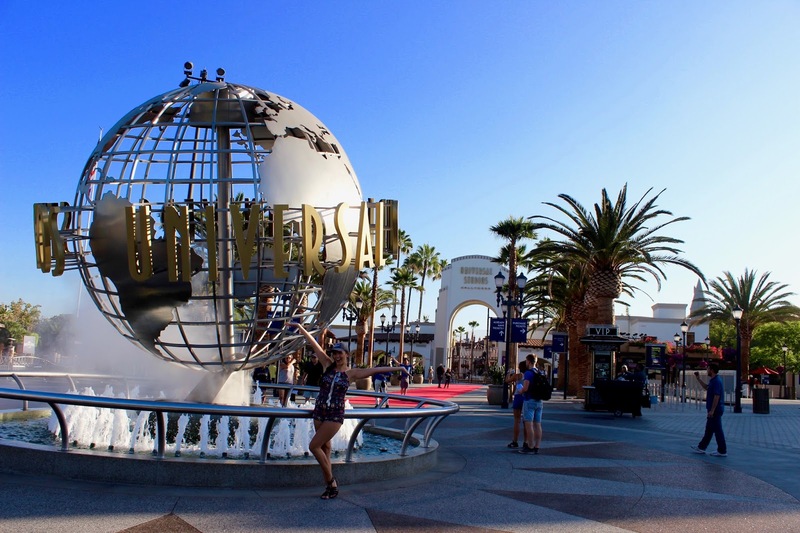 I guess everybody of you knows the famous Universal studios in Hollywood, so I don’t think I have to explain a lot. 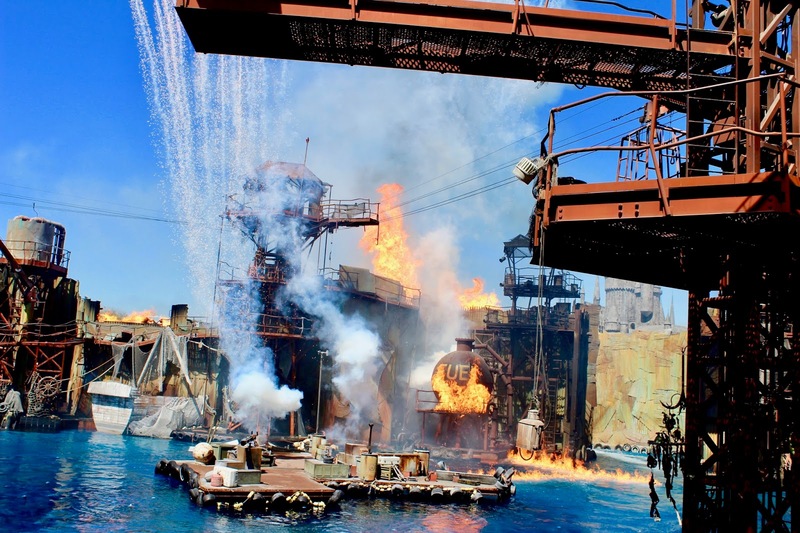 Basically it is an incredible theme park all about film production in Hollywood - so you don’t only have the actual Film studio tours, but you also have attractions and rides themed after famous movies made there, f.e. Jurassic Park, The Mummy or Transformers. The ticket per person is around 90-100$, so it is rather pricy. But to be honest - it is worth every single penny. My parents aren’t big fans of theme parks and stuff like that, but even them loved Universal Studios so much. What I personally find really nice about the rides is that they are quite short, so you rarely have to wait long to get on them and can go on all the rides on one visit. But be prepared to probably suffer from a little headache due to the awesome 3D technology at the rides added to a lot of sun and heat - but it is so worth it! We also were fascinated by the various shows the park offered which ranged from special affects to animal actors, and our personal favourite: the water world! 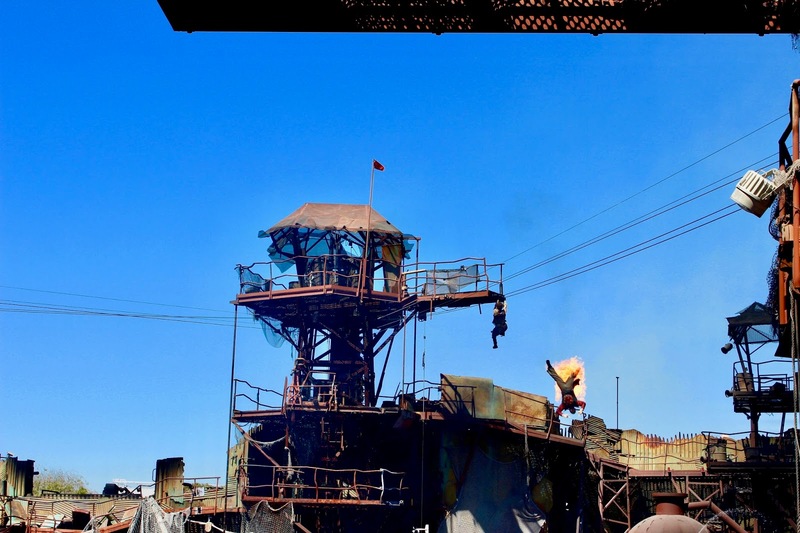 If any of you guys know the movie water world, you will love this show as they recreated the filming set to showcase live special effects - the actors were actually burning, which was so impressive! 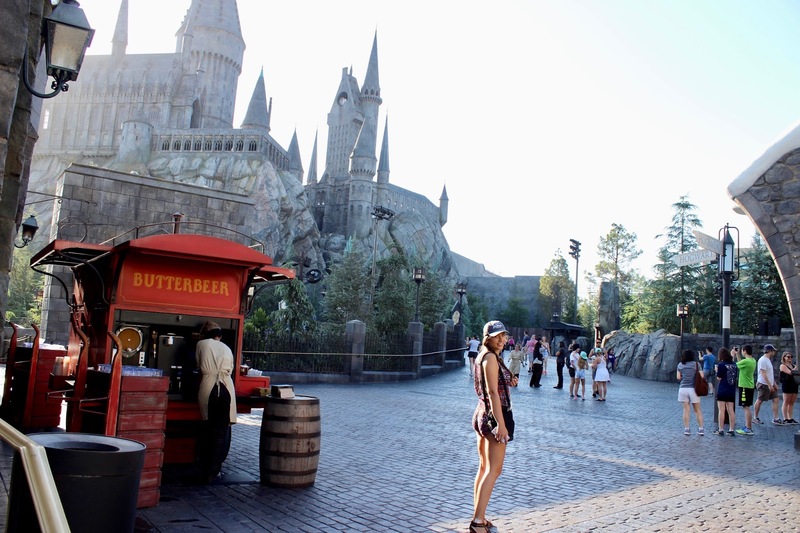 And what I cannot forget to mention is obviously: the Harry Potter world, which was only opened in April this year. What can I say guys, I was mesmerised, my parents were loving it as well - it is simply incredible. 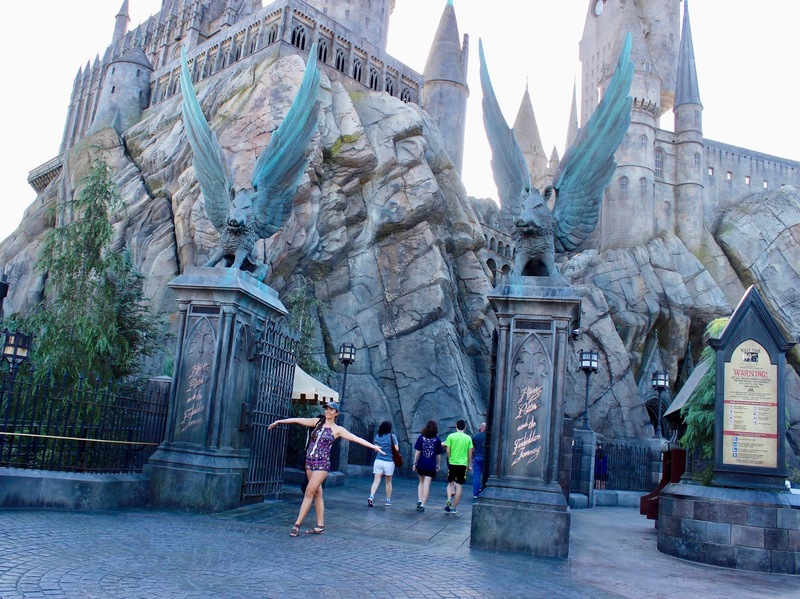 I visited the original Harry Potter film studios in London, but I have to admit that the Harry Potter world in the Universal studios is by no means not as incredible as the ones in London. 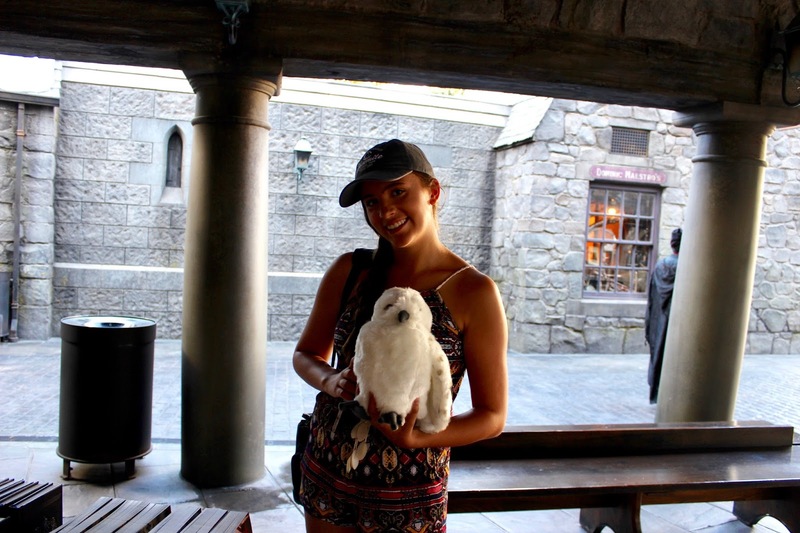 Everything is set up in such lovely detail and the 3D ride in the Hogwarts castle, where you get to fly around Hogwarts with Harry was unbelievably insane! Pro Tip: get your tickets online prior to your visit and get into the park 1 hour earlier than all the other guests! We did that and it was seriously the best decision, not only because the park was almost empty, but also because the temperature was still sustainable (we visited LA in the end of august so in the afternoon it was too hot to enjoy) - so make sure you use the morning hours as they are the best ones to explore this awesome place. I think this is quite a popular activity to do, but for a good reason: the endless ocean of lights is truly fascinating. It was a little bit crowded to be honest, although we were willing to bare it given this spectacular view. 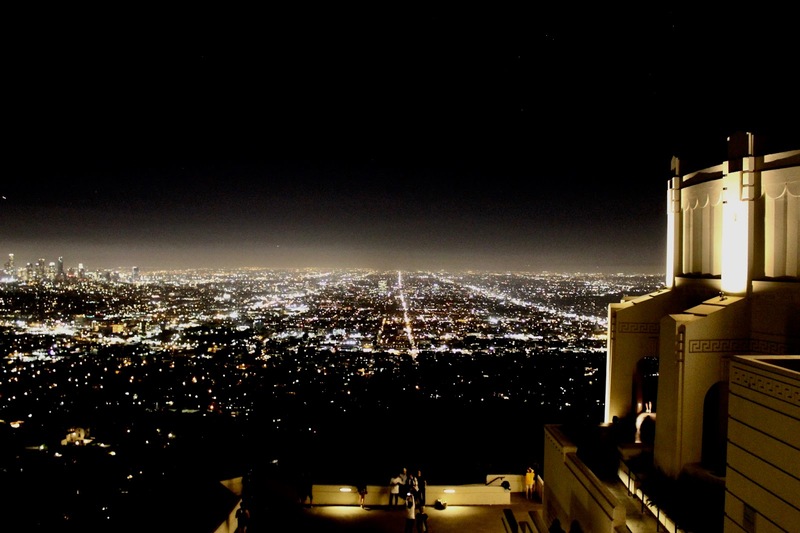 For those of you who don’t know: Griffith Observatory is sitting in the Hollywood Hills next to the Hollywood sign, so you have a gorgeous view over the city of Los Angeles as well as at the Hollywood sign. Although unfortunately it is not light (I was expecting that given the fact that it is THE Hollywood sign) so you can’t really see it at night. Standard touristy attraction as well, but admittedly rather nice for a casual stroll along the pier. 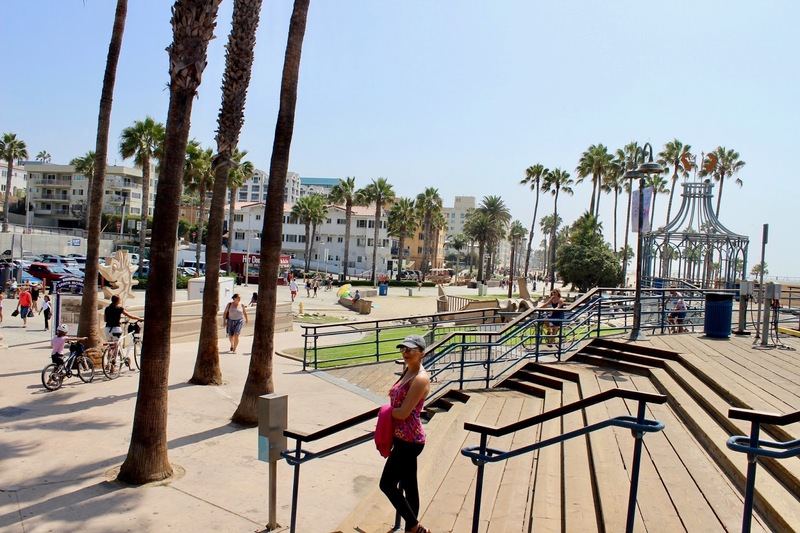 Everything is obviously quite overpriced (the rides and the food), but just take a walk all the way down, enjoy the fresh ocean air and soak in some sunshine. We also listened to a really good musician there which was finishing off this relaxing morning activity quite well. 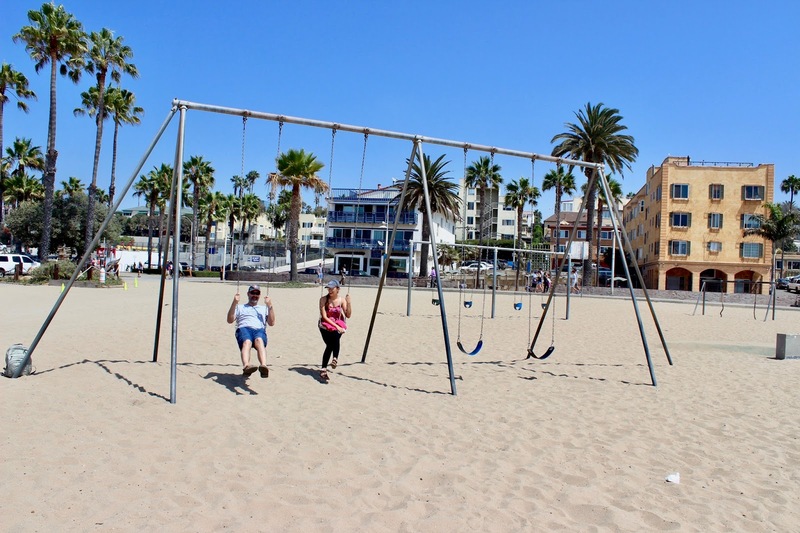 Venice beach is well-known for its street performers, artists, funky atmosphere and obviously the muscle beach filled with fitness geeks wanting to show off their muscles - quite an interesting experience as there are indeed people working out. 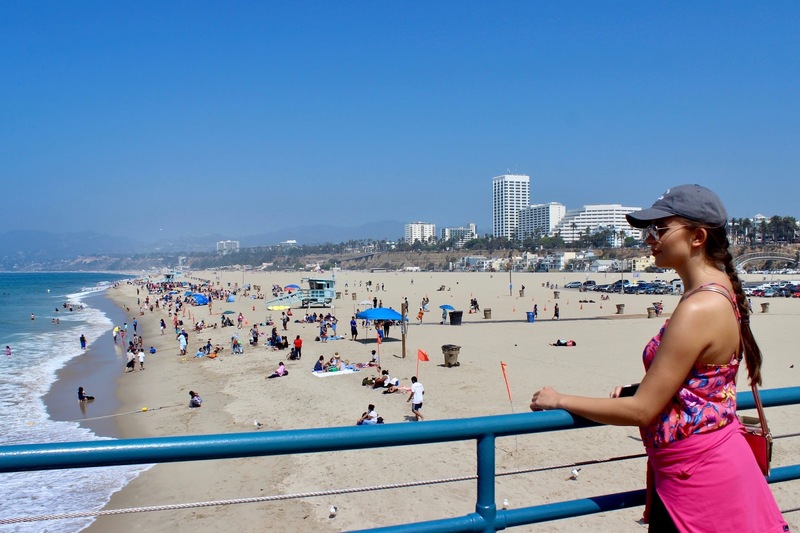 For us it was simply a nice and relaxing beach walk along the pacific ocean, enjoying the sun and the refreshing cold water - and it is also right next to Santa Monica Pier, so it doesn’t really take much time to take a little walk. You an also rent some bikes which I imagine rather fabulous and cycle along the Venice Beach Boardwalk for a little longer. 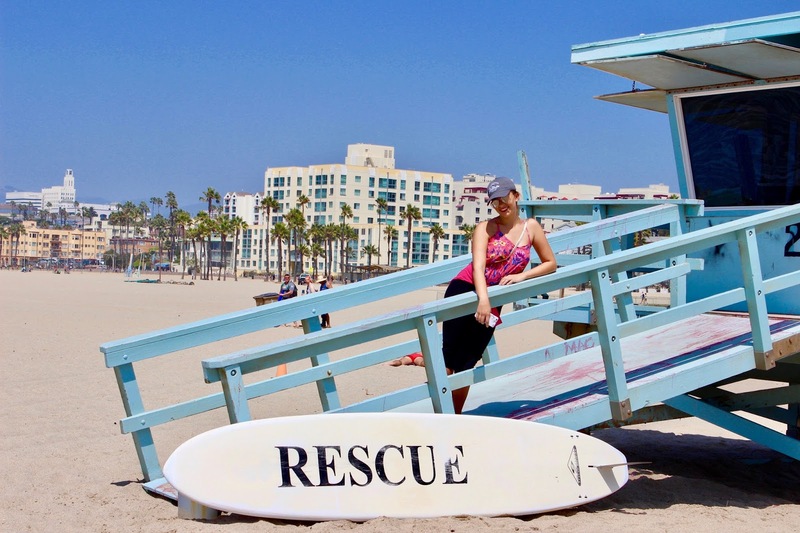 Unfortunately there wasn’t a picturesque lifesaver around to take a picture with so I just posed by myself. I had to include this one as those donuts are seriously heavenly. We had them every morning for breakfast and there were so delicious - except you don’t like sugary, unhealthy treats than this is probably not for you. 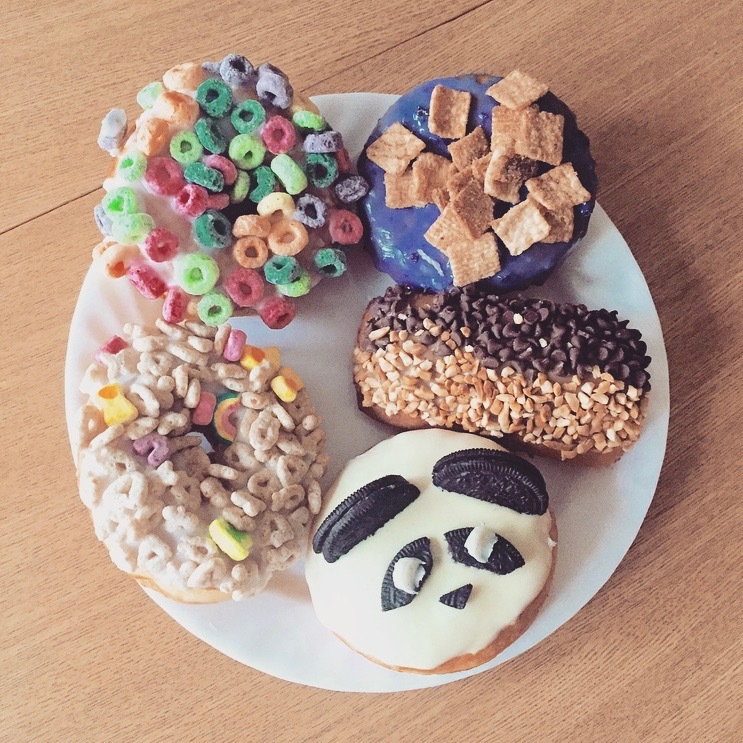 And not gonna lie - I really wanted to take a picture with them as they are the typical white-girl-instagram-tumblr-pinterest donuts. Admittedly, they are really photogenic tho. 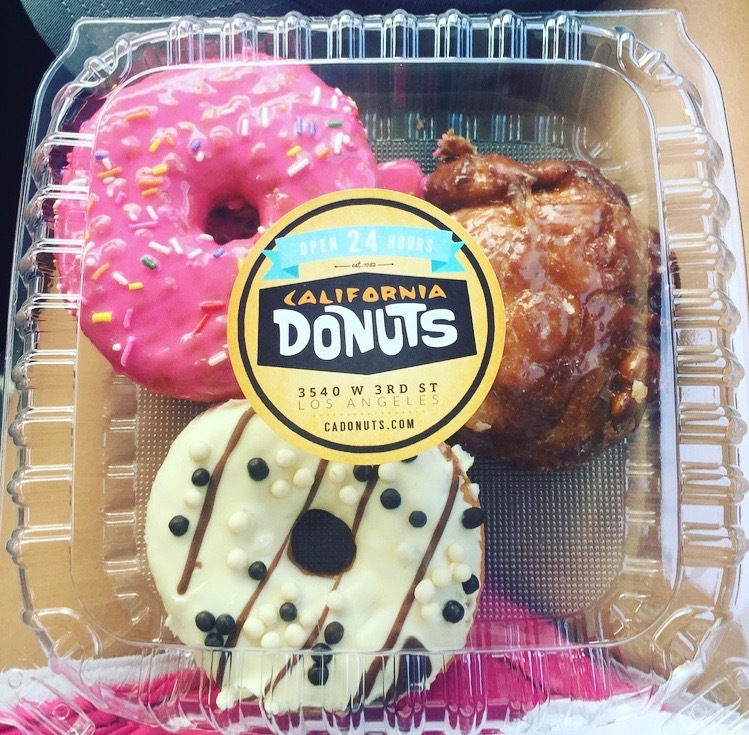 My parents and my recommendation would definitely to try the apple fritter - not the typical donut, but SO incredibly yummy. With the festive season coming closer and closer, I thought it would be the perfect time to show you my take on a elegant, classic holiday look. Being a lover of feminine, delicate lace designs, I paired this lovely blouse with simple and comfy black trousers and my leather over the knee boots. For accessories I chose a black clutch with gold detailing and a subtle rose gold bracelet as I wanted to set the focus on the bright red lips, which are an absolute holiday must-have for me. For a finishing touch, I curled my hair for soft loose curls. Lots of love to my incredibly talented friend Corey for taking some lovely pictures in this rather fabulous location - the Aberdeen City Council with an architecture that reminds me a lot of Hogwarts. 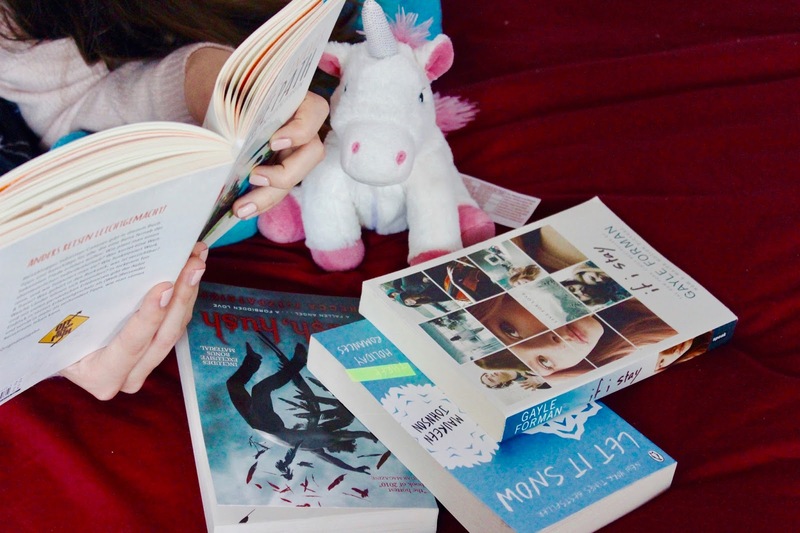 With the days getting colder and darker, everyone tends to get into a more cozy spirit, which makes this time of the year the perfect time to snuggle up in your bed and dive into a lovely book. Therefore today’s post is all about my recommendations on what to grab for a good winter read. I chose 4 completely different books in order to enable everybody of you to hopefully find at least one story that fits your taste. I incorporated book descriptions from amazon to make it easier and quicker for you to decide whether that story is something you could enjoy reading. Thank you to my wonderful friend Lola for taking those lovely pictures! This book has been on my reading list for quite some time now and when we were bored waiting at San Francisco airport I finally got it. The story is obviously not always bright, happy and bubbly, but I must admit that I really do enjoy reading such books from time to time. You can just draw a lot of inspiration and wisdom from stories like that and especially this book impresses with a lovely detailed writing style (really similar to my all time favourite book “Before I Fall“). So if you are looking for a more serious and thoughtful book to read this winter season, I would definitely suggest this one. I got this book upon the recommendation of one of my favourite Youtubers Kalyn Nicholson, so shoutout to her for introducing me to this fantastic book. I adore the mysterious, dark and autumnal vibes this books conveys a lot and the incredible writing style makes it really easy to empathise with the characters. I especially enjoyed the conversations between the two main characters Patch and Nora as the clever yet charming way in which Patch was teasing Nora made me smile quite some times (you will see what I mean when you read it yourself). This is a recommendation for all my German readers (or if you simply want to step up your German language game). My best friend gave this book for me before I set out on my journey to Scotland and I love it a lot as the author gives amazing travel tips in an rather entertaining and inspiring way of writing. 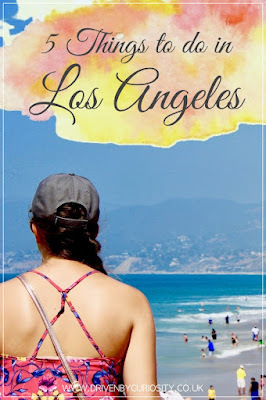 Just a little warning: even just reading 2 pages of this book gives you serious wanderlust, so be prepared for immediately wanting to plan your next trip after reading this book! This is a new book I randomly stumbled across when wandering through one of my favourite stationery and book shops. The gorgeous cover as well as the amazing authors made me get this book and although I have not finished it yet, I already enjoy the story’s fun, happy and romantic atmosphere a lot.